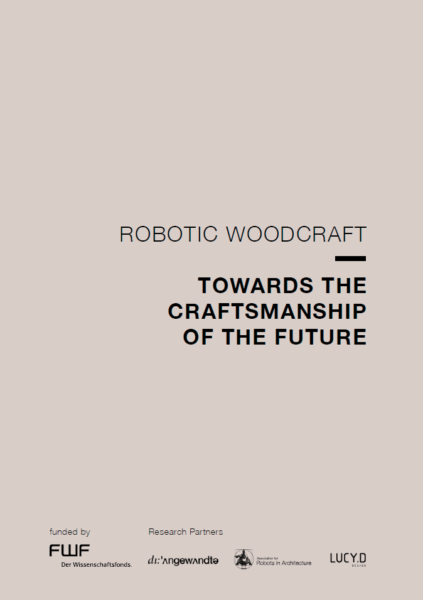 Our publication Robotic Woodcraft: Towards the Craftsmanship of the Future showcasing the results of the Robotic Woodcraft research project can be downloaded below! 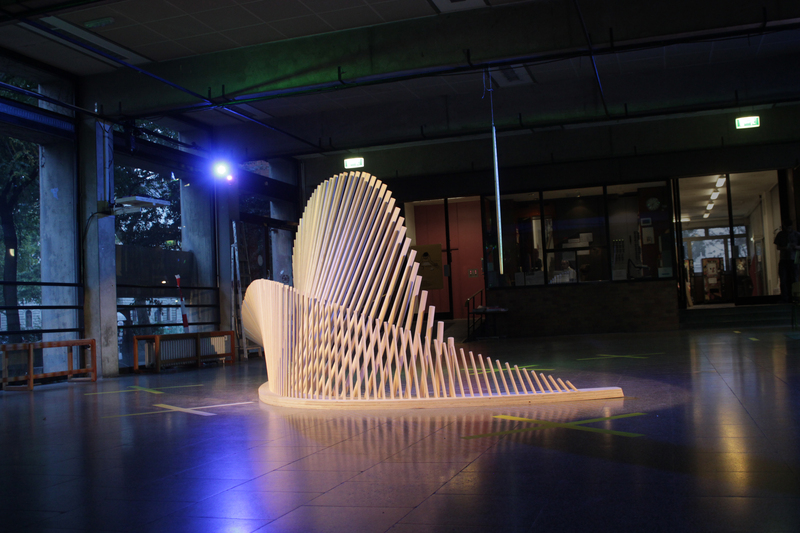 We’ve used our KUKA robot to fabricate a wooden sculpture designed by Prof. Josef Kaiser, investigating a combination of common CAM software and custom parametric fabrication strategies. The research team of the Association for Robots in Architecture was part of the RWTH Aachen’s team DIANA (Chair for Individualized Production and IMA/ZLW & IfU), competing for the KUKA Innovation Award. 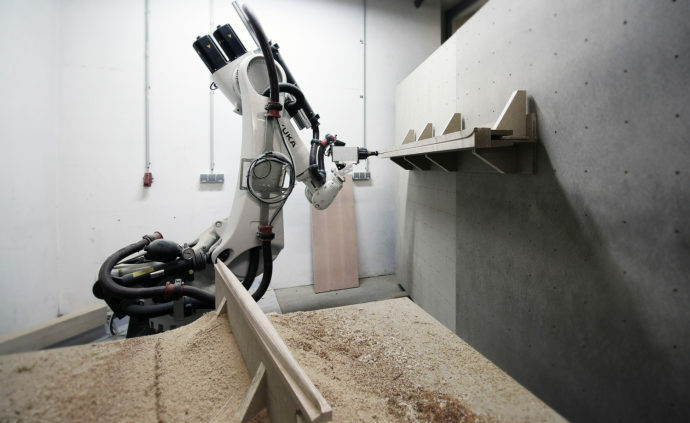 At the Hannover Messe 2016, the team presented a novel application that used a KUKA LBR iiwa’s “sensitivity” to compensate for the inaccuracies of a natural material like wood. 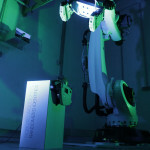 Robotic Mass Customization from robotsinarchitecture on Vimeo. 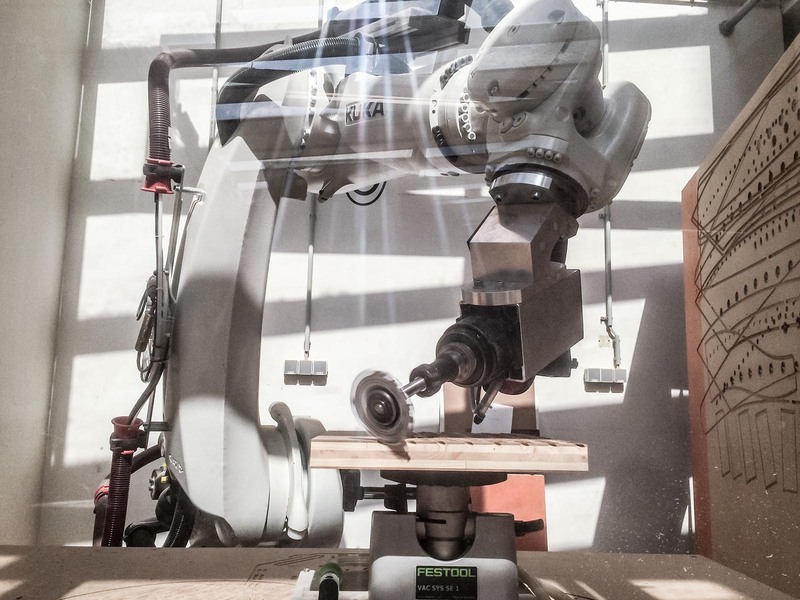 As part of the Rob|Arch 2016 conference on robotic fabrication in architecture, art, and design, the Robotic Woodcraft project presented the results of the Robotic Mass Customization Workshop. 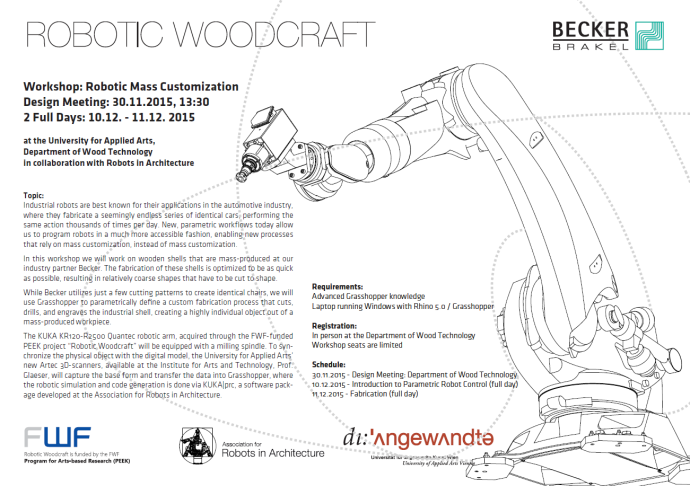 In this 2-day workshop, Robotic Woodcraft collaborated with the high-end manufacturer of moulded plywood, Becker KG. Using parametric definitions, we transformed standardized, “raw” wooden shells into highly customized products, using a heavy-payload KUKA Quantec robot and the robot-programming/simulation environment KUKA|prc. 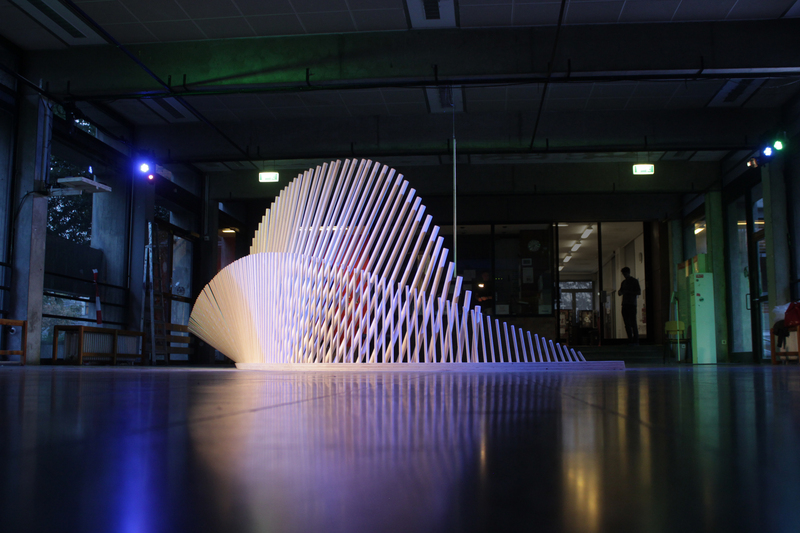 Flexous Filaments by Philipp Hornung is a robotically fabricated, wooden, hybrid light-weight structure, which was developed as part of his Diploma thesis at Studio Zaha Hadid, Institute of Architecture at the University of Applied Arts in Vienna, with the support of Robotic Woodcraft. The project implements a multi-layered design process, taking material-, fabrication- and assembly properties as well as constructional and structural aspects into account and was applied in form of a pavillion. A network of dynamically shaped, co-acting beams consisting of several interlocking developable single curved panels are forming a double curved space. 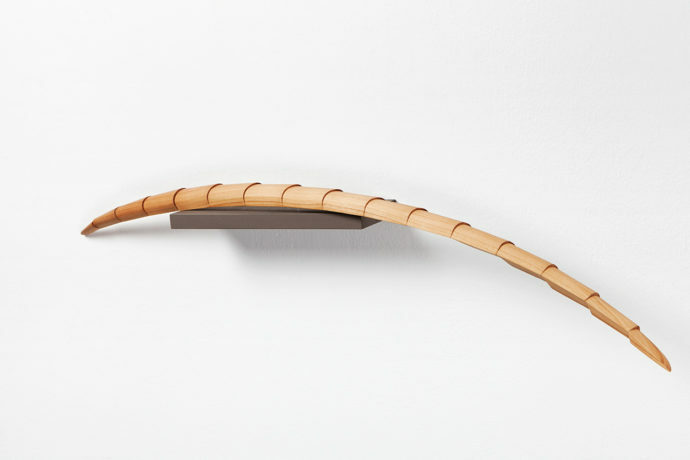 All parts are machined from thin, 4mm birch plywood, incorporating the formative and structural working finger-tenon-joints as well as all constructional details. When being assembled, the panels snap in place and interlock reciprocally when being bent to the predefined curvature and thus form the intended shape. The entire process was designed on a parametric workflow including digital design, structural analysis, detailing, optimized nesting and generation of machine code. 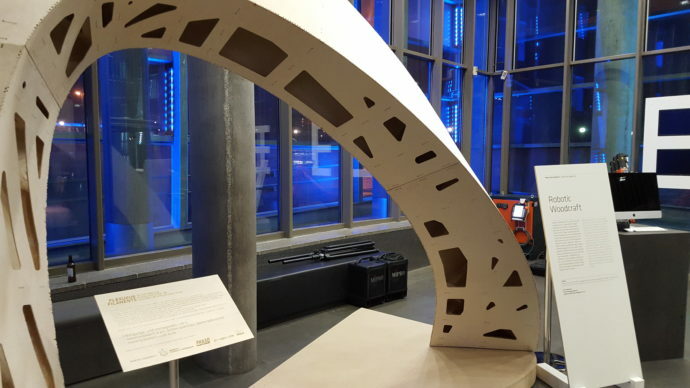 To verify the assigned research qualities, a full scale prototype was realized within three days, forming a tremendous arch, weighing just 25kg and spanning more than six meter. 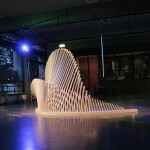 As part of the Creative Robotics exhibition, Flexuous Filaments was exhibited at the Ars Electronica Center alongside exhibits from the University for Arts and Design Linz as well as JKU Linz. We’re working with artist Roman Pfeffer on fabricating a series of small-scale wooden boat-shapes, based on a digitized version of a full-scale boat that he bought, cut up, and reassembled. In collaboration with our industry partner Becker we are hosting a workshop on Robotic Mass Customization at the University for Applied Arts Vienna. Industrial robots are best known for their applications in the automotive industry, where they fabricate a seemingly endless series of identical cars, performing the same action thousands of times per day. New, parametric workflows today allow us to program robots in a much more accessible fashion, enabling new processes that rely on mass customization, instead of mass customization. 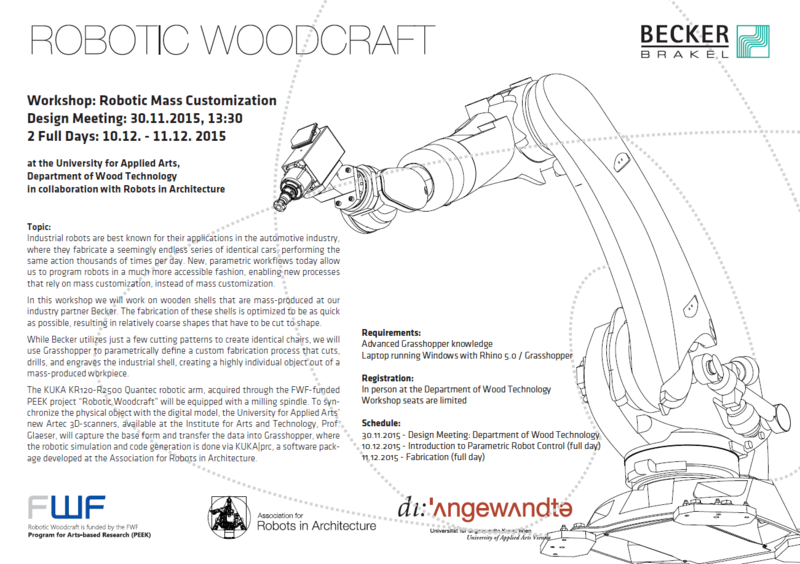 In this workshop we will work on wooden shells that are mass-produced at our industry partner Becker. The fabrication of these shells is optimized to be as quick as possible, resulting in relatively coarse shapes that have to be cut to shape. While Becker utilizes just a few cutting patterns to create identical chairs, we will use Grasshopper to parametrically define a custom fabrication process that cuts, drills, and engraves the industrial shell, creating a highly individual object out of a mass-produced workpiece. 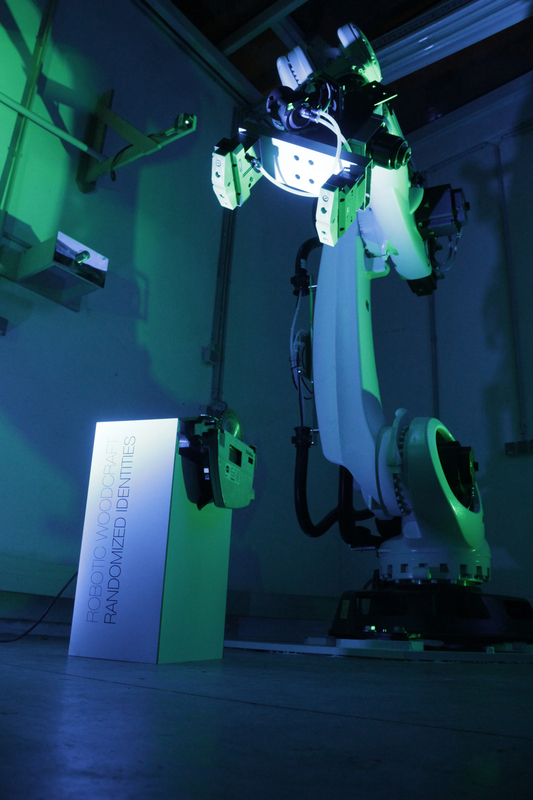 The KUKA KR120-R2500 Quantec robotic arm, acquired through the FWF-funded PEEK project “Robotic Woodcraft” will be equipped with a milling spindle. 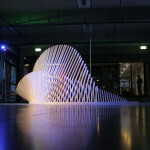 To synchronize the physical object with the digital model, the University for Applied Arts’ new Artec 3D-scanners, available at the Institute for Arts and Technology, Prof. Glaeser, will capture the base form and transfer the data into Grasshopper, where the robotic simulation and code generation is done via KUKA|prc, a software package developed at the Association for Robots in Architecture. The workshop will be attended by students, researchers, and industry. generated patterns and the associated process information orchestrate and actuate computer controlled woodworking tools; at the same time seamlessly creating and materializing three dimensional surfaces. In this sense, they stand for a new form of integrated product and process development and all-together for a new way of thinking design and future production sites. For more details visit the project page. As part of the international eCAADe 2015 conference, this year hosted by TU Vienna, the Robotic Woodcraft team is hosting a two-day robot workshop. We’re expecting a highly interdisciplinary group containing architects, designers, wood experts, and engineers to attend the workshop and will provide a hands-on experience with the technologies and approaches that have been developed within the research project.